Velocity Unified Communications Collocation services provide you with a direct connection to a fiber-optic backboned network. 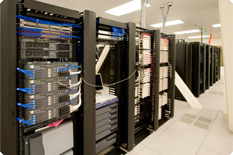 Organizations that are in need of a home for new data center equipment or for connecting servers and routers to the Internet will find access to our collocations sites to be a strategic and value-added option. Velocity Unified Communications Collocation facilities house premium space built according to uniform environmental and security standards for power, cooling, fire suppression, security and easy access to overhead and raised floor cabling. Access to over 25 Collocation facilities located in ultra-high demand buildings and markets in North America and Caribbean. Flexibility to build Collocation suites tailored to meet your organizational needs and requirements.